This page highlights our past signia surface projects — focused on using everyday surfaces to spread signia, or significant information — in metro Washington D.C., where Learning Life is based. In November and December 2013, with funding from the City of Alexandria and local sponsors, Learning Life undertook a “buy local, learn local” project that promoted Alexandria businesses and history museums. Learning Life designed, printed and distributed free “buy local, learn local” wallet cards and tote bags which area residents could use to visit the city’s history museums and to get special holiday discounts to fourteen local businesses in the eclectic Del Ray neighborhood of Alexandria. We also created two Alexandria history quizzes (see Quiz 1 and Quiz 2) in cooperation with the City’s Office of Historic Alexandria, which we promoted via a weekly project e-newsletter. The e-newsletter also offered interesting city history facts, discount details and the opportunity to win local business gift certificates for perfect scores on the city history quizzes. Learn more about this project here. centers in Washington D.C. The napkin, featured here, posed the question “Who did JFK defeat to become President in 1960?” with the answer provided upside-down. 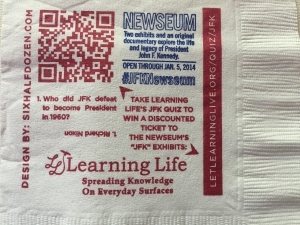 The napkin also invited readers to take a five-question JFK quiz at Learning Life, through which quiz takers could get a discounted ticket to the Newseum. Learning Life promoted the quiz and the Newseum’s JFK exhibits through the napkins, online promotion and street theater in which an actor playing JFK delivered his 1961 inaugural address at several locations in Washington D.C. For more, see Learning Life’s brief promotional video about this project. facts leading to more learning at our website. 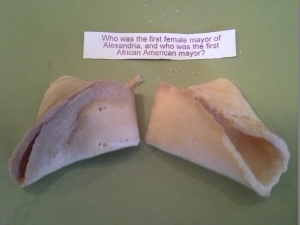 Learning Life distributed the cookies free in restaurants, bars, cafes and other local businesses in Alexandria. Donations were requested, with all proceeds benefiting Learning Life and the Historic Alexandria Foundation. See more photos of some of the cookies as well as the questions and answers posed inside them here. 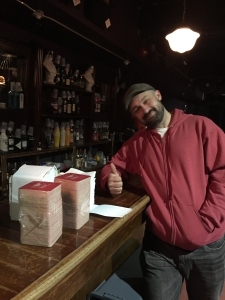 In Winter 2015 Learning Life worked with DC Health Link to disseminate 10,000 napkins and 5,000 coasters in selected D.C. neighborhood restaurants and cafes to inform residents of the city’s own health insurance exchange, and how to get covered. 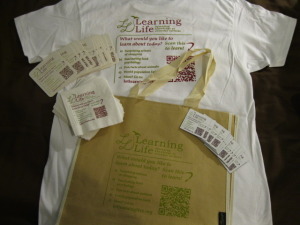 Learning Life has its own branded surfaces — beverage napkins, drink coasters, fridge magnets, tote bags and t-shirts — that invite readers to learn at our website, with our website address and a QR code printed on each surface. To learn more about any of the above projects, contact us at email@learninglife.info.